The iPod touch sets the time and date automatically after you connect it to your computer or the Internet. Other iPod models set the time and date when you set them up on your computer. From the Home screen, choose Settings→General→Date & Time. The Date & Time menu appears with the Set Automatically option set to On, along with the 24-Hour Time and Time Zone options. (Optional) If you’d rather see military (24-hour) time, tap the Off button for the 24-Hour Time option to turn it on. With the 24-hour display, 11:00 p.m. displays as 23:00:00, not 11:00:00. To turn off the 24-Hour Time option, tap the On button. Turn the Set Automatically option off in order to set the time and date manually. The Set Automatically option is turned on by default. If this is okay with you, skip to Step 10 (you’re done). If not, touch the On button to turn the Set Automatically option to Off, so that you can see the option for setting the time and date manually. After turning off the Set Automatically option, the Set Date & Time option appears under the Time Zone option. Tap the Time Zone option to set the time zone. The onscreen keyboard appears. Type the name of the city you’re in (or if you’re in the middle of nowhere, the nearest big city in your time zone) and then tap the Return button on the keyboard. Your iPod touch looks up the time zone for you. 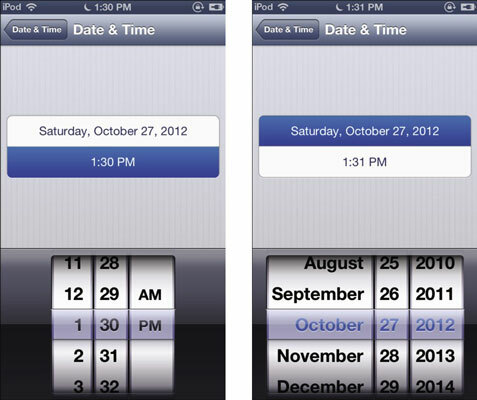 Tap the Date & Time button in the upper-left corner of Time Zone screen to finish and return to the Date & Time menu. Tap the Set Date & Time option. Tapping the Set Date & Time option brings up the Date & Time screen with a slot-machine-style time wheel. The Time field is already selected. Slide your finger over the time wheel to set the hour, minutes, and AM or PM. Slide until the selection you want appears in the gray window on the slot-machine wheel. The time in the Time field changes to reflect your new setting. Tap the Date field to see the date wheel. Slide your finger over the date wheel to select the month, day, and year. To finish, return to the Date & Time menu. Tap the Date & Time button in the upper-left corner of the Date & Time screen. Tap the General button in the upper-left corner of the Date & Time menu to return to the General menu for settings.